Sorry I haven't been updating this blog much recently. The last month has been kind of crazy. I meant to have this review up sooner, but this is the first time I've really had to sit down and blog in a while. Anyway, enough with my whining. 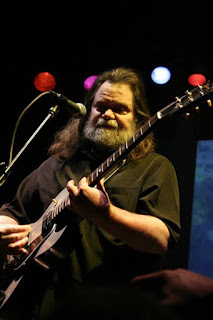 This concert was part of the Beachland Ballroom's 10th anniversary weekend, and what better way to celebrate than with a rare live performance by Texas rock legend Roky Erickson? The show started off with local band Living Stereo, a band that straddles garage rock and eightes power pop. The songs were catchy and the band was tight, but they just didn't have enough grit for my tastes. 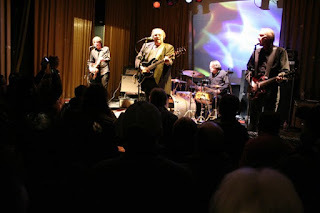 Next up was The Alarm Clocks, a sixties garage rock band from the Cleveland area who have reunited to play the occasional show in the past few years. I'll be honest, before they started to play I was a bit worried. I thought to myself that the bass player looked like half the home improvement salesmen I used to work with. But as soon as these guys started playing, all doubts vanished. There's a certain attitude any good garage rock band has to have that just can't be faked, and these guys have it. There sound was sort of a cross between the raw fury of The Sonics and the more sophisticated garage rock of Them. Very good stuff, and I will definitely be picking up whatever recordings I can find from these guys. Then it was time for Roky. If you know Roky's personal history, it's a miracle that he's back on stage playing at all, so I had my expectations set a little low. And I'm not gonna' lie, there were definitely some rough spots in the show where Roky seemed to get a little lost. Fortunately he had a good backing band who were able to go with the flow and get things back on track whenever that happened. Roky stuck mainly to his hard rocking horror-themed material from the eighties. He opened the set with "Cold Night For Alligators" and continued on with a rousing "Creature With the Atom Brain". I don't remember the exact order, but Roky and his band went on to play "Don't Shake Me Lucifer", "Night of the Vampire", "Stand for the Fire Demon", "The Wind and More", "The Beast" and "Bloody Hammer". "Starry Eyes" was the only song representative of Roky's quieter side. It would have been nice to hear at least one more ballad in the set, but I'm not going to complain. As expected, Roky also played his best known hit from his days as singer for The 13th Floor Elevators, "You're Gonna' Miss Me". Considering how many times he must have performed this song, it was kind of surprising when this one went off the rails and almost fell apart. Luckily the final song of the night, "Two Headed Dog (Red Temple Prayer)" came off much better. All in all it was a pretty damn good show. Roky's voice has gotten a bit rougher with age, but still sounds pretty good. As a fan, I was more than happy with the performance. Here's hoping he comes back again after his new album, True Love Cast Out All Evil, is released in April. really wish i could've seen that show!